What better way is there to enjoy a summer day then a swim? However, it is important to remember beach safety while enjoying a day in the sun. We can not stress enough how crucial it is to check the water quality at the beach before taking a dip. Our app Swim Guide makes checking water quality easy. But, there are other dangers to be aware of at the beach … and no, we aren’t talking about shark attacks. Rip currents are the number one reason for lifeguard rescues at the beach, and still it is estimated that every year 100 people are killed by rip currents in the U.S. alone. To put that in perspective, sharks kill about 5 people annually around the world. The term rip current refers to a narrow channel of water (rarely over 30.5 m wide) that flows away from the beach, perpendicular to the shore. Rip currents are dangerous for even the strongest swimmers because they are quick and powerful. A rip current can travel as fast as eight feet per second, which is faster than an Olympic swimmer. 1. Flash rip: They form suddenly and can disappear just as fast. They typically occur when wave conditions increase suddenly, or during storms. 2. Fixed rip: Are formed between sand bars and deeper channels, they can stay in the same place for days, weeks, or months. This is the most common type of rip current. 3. Mega Rip: Are the largest type of rip currents. They form during periods of extreme wave activity such as during a hurricane or heavy rain storm. 4.Permanent Rip: Occur in a place with a permanent obstacle like a pier, jetty or coral reef, making the rip current permanent. There is the common misconception that the term rip current is interchangeable with rip tide. But rip currents and rip tides are not the same thing. A rip current is not a tide at all, whereas, a rip tide is the movement of tidal water through inlets on a beach such as harbours, and estuaries. Where do rip currents occur? Rip currents don’t just form in the ocean, they can occur in any natural waterbody where breaking waves occur. So yes rip currents can occur on lakes, especially large lakes such as the Great Lakes in Canada and the U.S.
Rip currents can form regardless if the waterbody has a rocky or sandy bottom. When the waves break strongly and weakly at different locations, this causes the water to move in a circular motion and creates a narrow current that moves away from the shore. This current is called a rip current. Rapidly changing wave heights, sandbar breaks, weather and manmade shoreline structures (ex: piers) are all factors that contribute to a rip current occurring. They are especially common along the East, Gulf, and West coasts of the U.S., and along the shores of the Great Lakes in the U.S. and Canada. 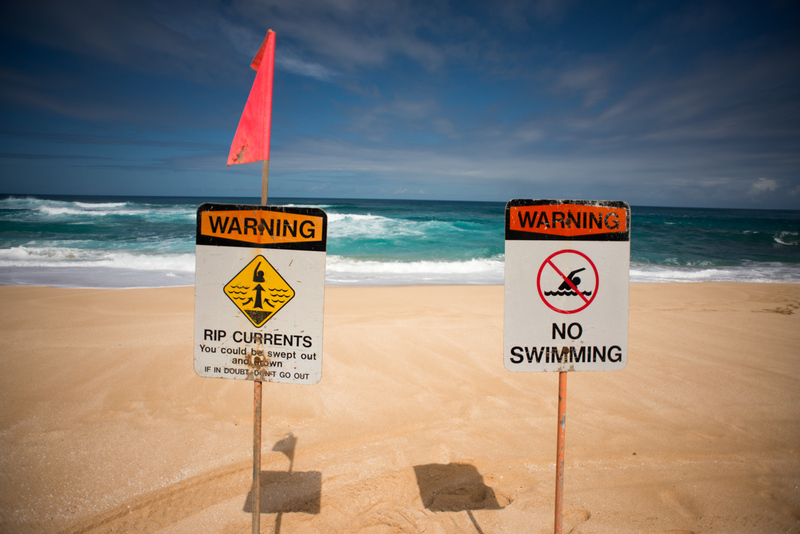 Most beachgoers can’t identify a rip current, but it’s important to learn how to spot one. Three tell-tale signs of a rip current include; a choppy channel of water with a circular motion, a line of seaweed or debris that is moving out to sea, and a disrupted pattern of incoming waves. The water is also likely to be darker in a rip current, or a muddy colour. Always look into the water conditions before you go swimming and try to go swimming at a lifeguard-protected beach. That way, you can ask the lifeguard for the surf conditions and of any known rip currents. If there is no lifeguard on duty, make sure there are other swimmers around. Never ever go swimming alone on an empty beach. The National Weather Service is an excellent resource of U.S. surf forecasts. If you do happen to get caught in a rip current, the most important thing to remember is not to panic. Panicking will only tire you out. Remain calm and remember that a rip current will just pull you farther from shore and not underwater. Don’t struggle against the current, as this is how most people drown. Instead, remain calm and conserve your energy. Try to swim parallel to the shore to escape the rip current. Remember, most rip currents are narrow so the swim won’t be that far. If you can’t swim out of the current, continue to tread water and float on your back. If you are able to get out of the current, swim back to the shore on a diagonal to avoid getting caught in the current again. However, if you are unable to swim out, raise both of your hands and call for help. This is especially important if you are not a strong swimmer. If there is no life guard on duty, get the attention of other beachgoers. This is why it is important to not go swimming at an empty beach. The Royal National Lifeboat Institution suggests you remember the three R’s if you get caught in a rip current. : “Relax, Raise (the alarm), and (wait for) Rescue.